I was in Singapore last week and while checking out the sights, I walked into this shopping mall to escape the heat and humidity. 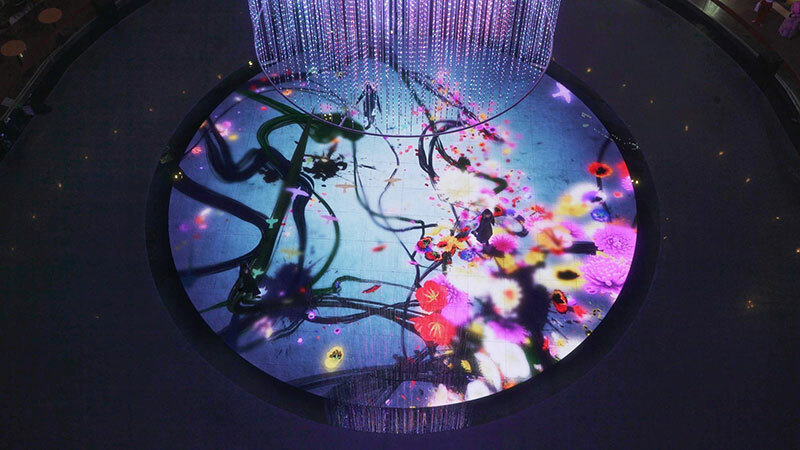 As I was headed to the food court section, I stumbled on this digital installation by Japanese art collective teamLab entitled Nature's Rhythm and Strokes of Life. 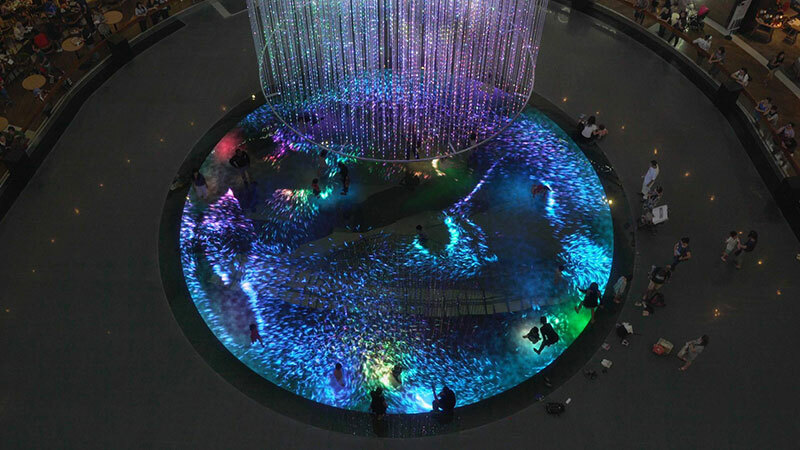 The work consists of a 15m diameter circular lighted rink and a 20m cylinder above consisting of a collection of light points. In the first scene, thousands of fish swim and react to the movement of people on the rink while a flock of birds flies through the cylinder in the air. Each person on the rink has a color, and the nearby fish receive the same color. In the second scene, Spatial Calligraphy is drawn in three dimensions when people stand on the rink giving life to flowers, birds and butterflies. The flowers that bloom changes throughout the year. Simultaneously the calligraphy appears in the cylinder above as a three-dimensional light sculpture of brushstrokes. The work is rendered in real time by a computer program, neither a prerecorded animation nor imagery on loop and the work as a whole constantly changes, never repeating previous states. Fortunately, there was this little kid running around the rink interacting with the work that made it even more special. 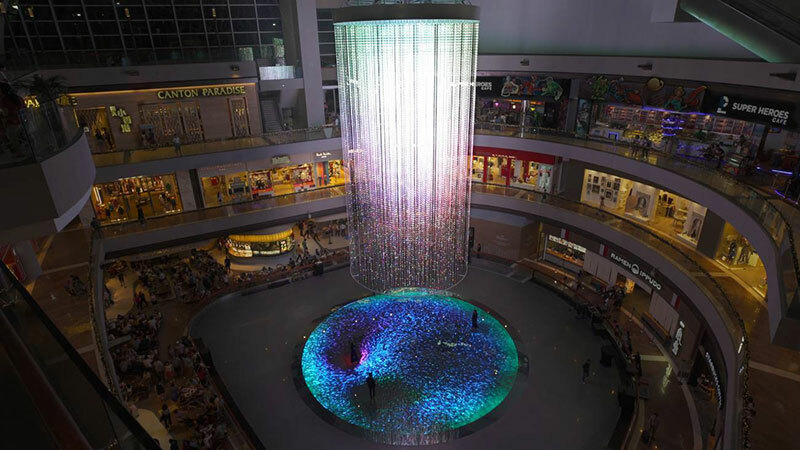 I was in Singapore last week and while checking out the sights, I walked into this shopping mall to escape the heat and humidity. 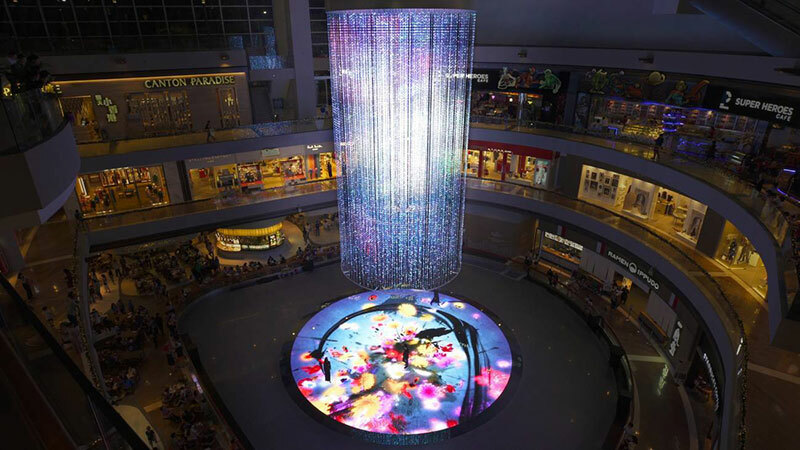 As I was headed to the food court section, I stumbled on this digital installation by Japanese art collective teamLab entitled Nature's Rhythm and Strokes of Life.